The Harrisburg Artsfest is a 3 day-long juried craftshow during Memorial Day weekend and along the Susquehanna Riverfront. The artwork includes pottery, painting, photography, metalwork, jewelry, fabric arts, leather, stonework, knives, brooms, and of course, woodworking. I spoke with 3 of the woodworkers who were, as I have found most woodworkers to be, friendly people who generously share their knowledge with you. June Burns, along with her husband, Tony, own Peachie Originals. They collect and use antique scroll saws to create puzzles for children. They also have written 3 books showcasing some of their original designs and how to make them. 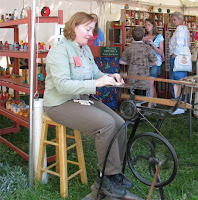 June was demonstrating with an 1860s treadle scroll saw which is powered by one foot that pumps a pedal. She switched feet while we were talking, because her one foot had run out of gas. During the show, June cut out little shapes to give away and in 3 seconds, she had scrolled a shamrock for me. Steve Strouse makes Shaker oval boxes in various hardwoods including cherry, walnut, maple, elm, and lacewood, among others. He uses only locally-salvaged wood that comes from storm damaged trees, tree care services, and logs that would otherwise end up in a landfill, including one 143 year old Sugar Maple that had been removed from the county courthouse. On his website, Steve provides photos of his work, lumber preparation, workshop, and young daughter who helps him sand the inside of his oval boxes. 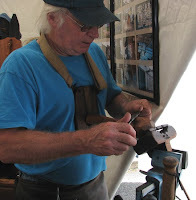 Maker of treenware, Bob DeWitt, of DeWitt's Spoons & Bowls, showed me how he uses a jig clamped in a vise to secure rough-sha ped spoons while he uses a drawknife for final shaping. 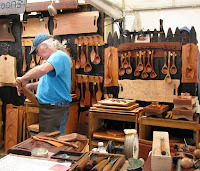 A board with a carved, shallow recess hangs on his chest and effectively wedges the spoon between the jig and himself. 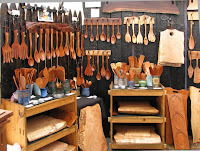 Bob uses gouges, a bent knife, and drawknives to shape his bowls and spoons, and upon completion, soaks the projects in water for days in order to raise the grain, sands them with 600 grit sandpaper, and applies mineral oil and beeswax. Finishing his pieces this way creates a burnished-type surface on whic h water pools rather than soaks into the wood. Every year, the Artsfest is an impressive gathering of talented people whose attention to detail and love of their craft is evident in their work. So, what did I buy at the show? 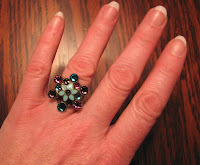 Hey, what's a woodworker without a little bling?